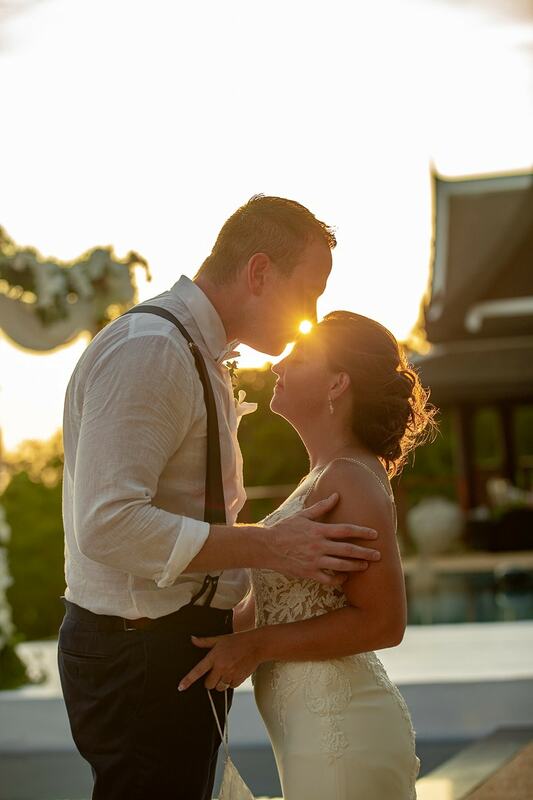 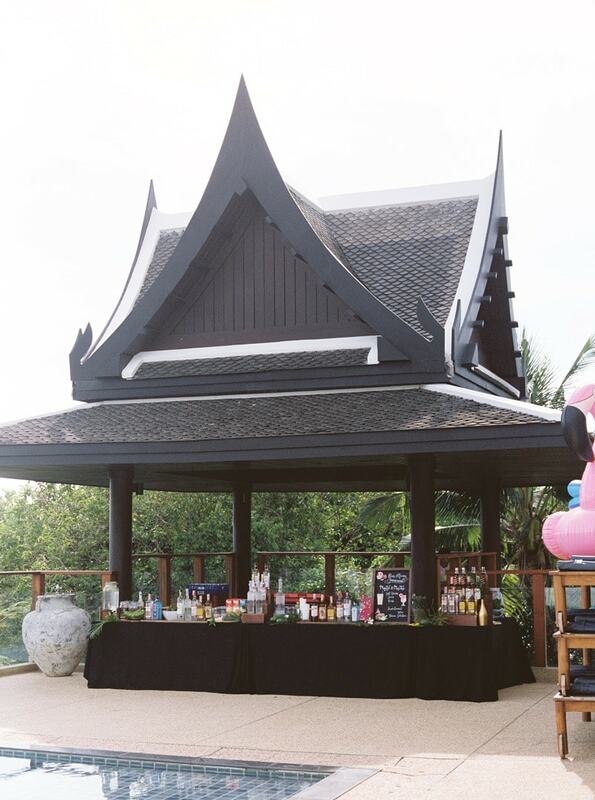 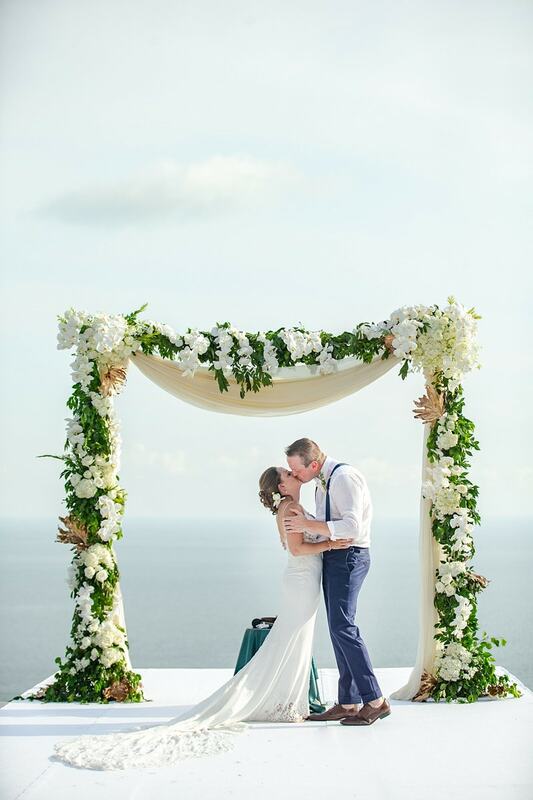 Thailand is always a fantastic choice for wedding destinations… and the fact that Amelia and David spent their first vacation there together makes it even sweeter! 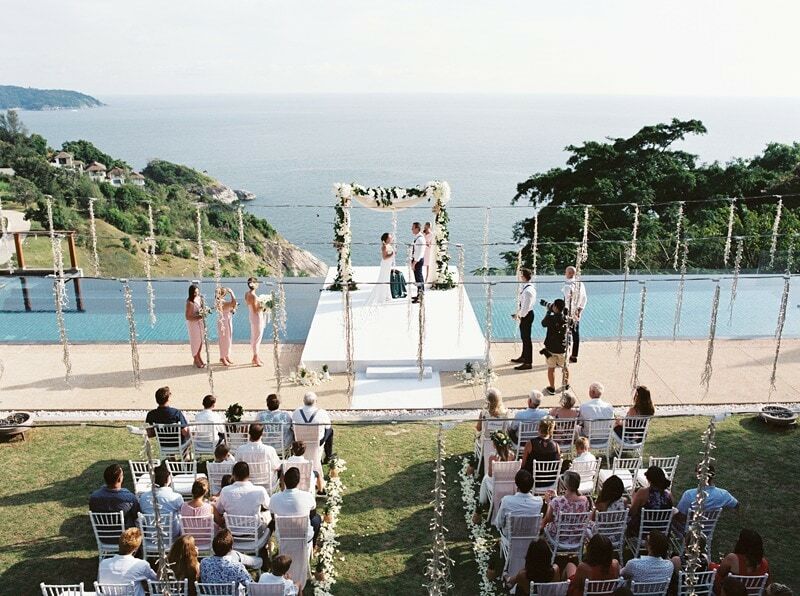 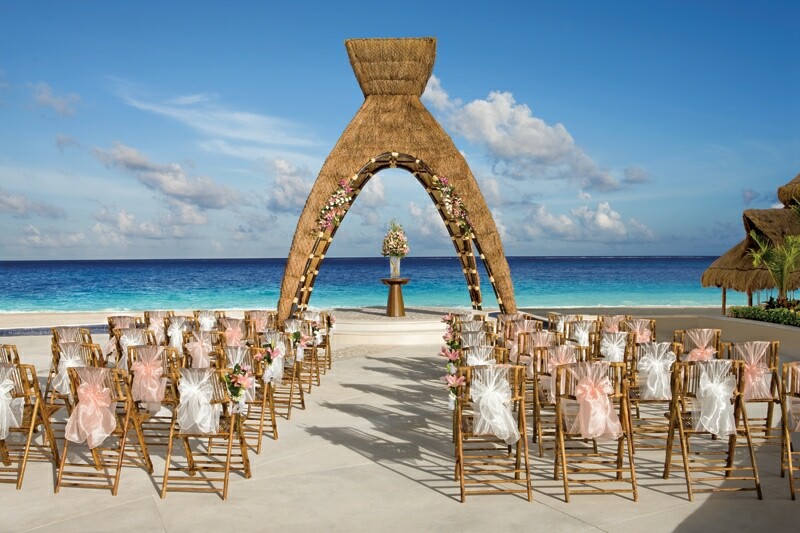 It’s no secret the tropical beauty of this nation is around every corner, and the view from this ceremony has it on full display. 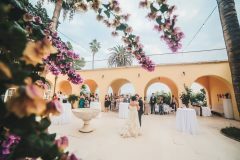 I’m absolutely in love with the hanging flowers over the ceremony and reception space, her bouquet, the flowers lining the aisle… there are just flowers galore! 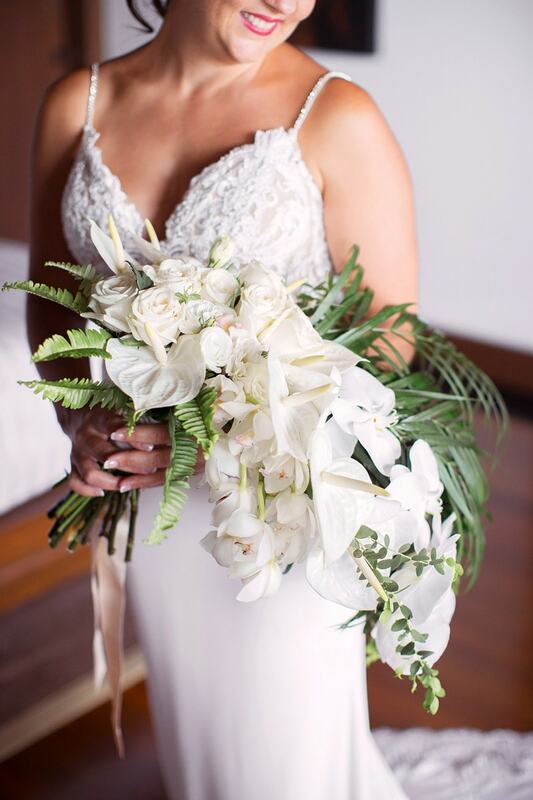 Such a romantic look. 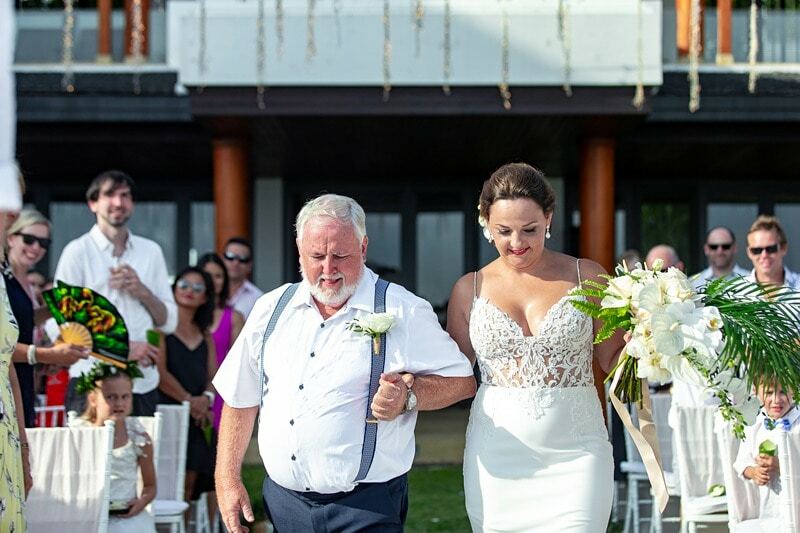 I’m also in love with Amelia’s dress – that train is to die for. 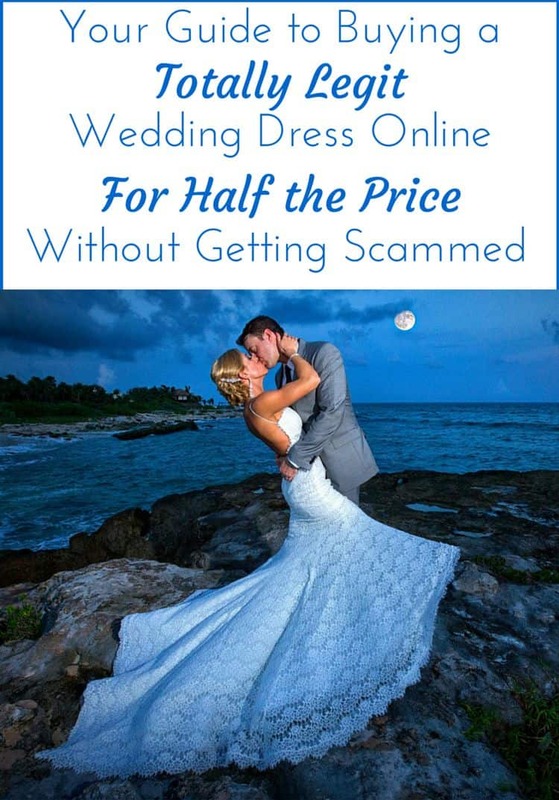 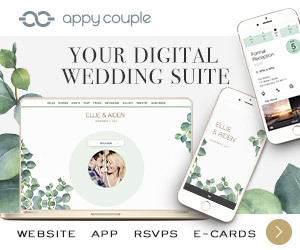 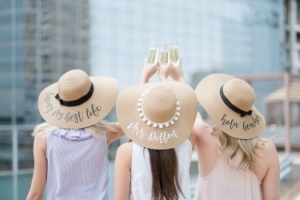 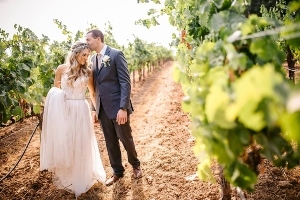 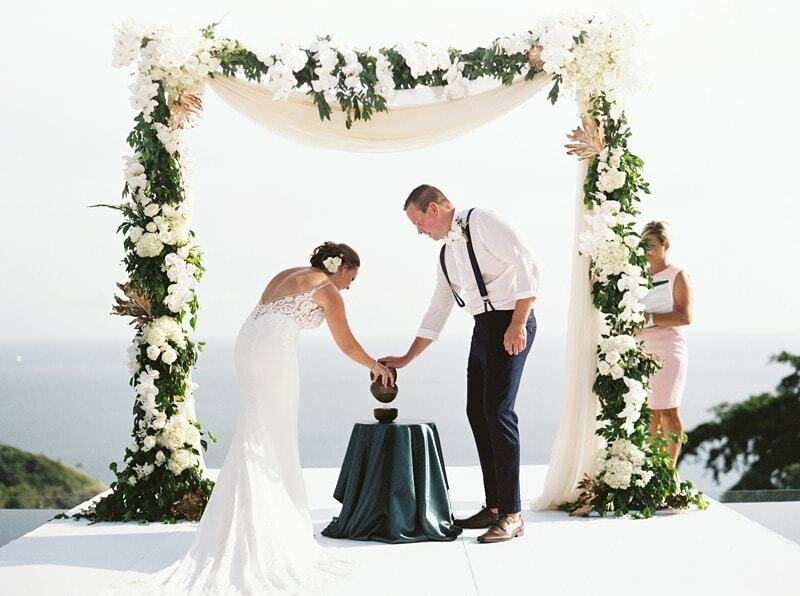 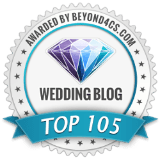 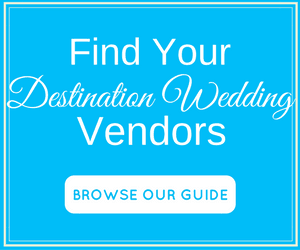 These two had such a gorgeous vision for their big day, but as most destination wedding couples know… it can be difficult to communicate that vision to a bunch of vendors who seem like they’re a world away during the planning process. 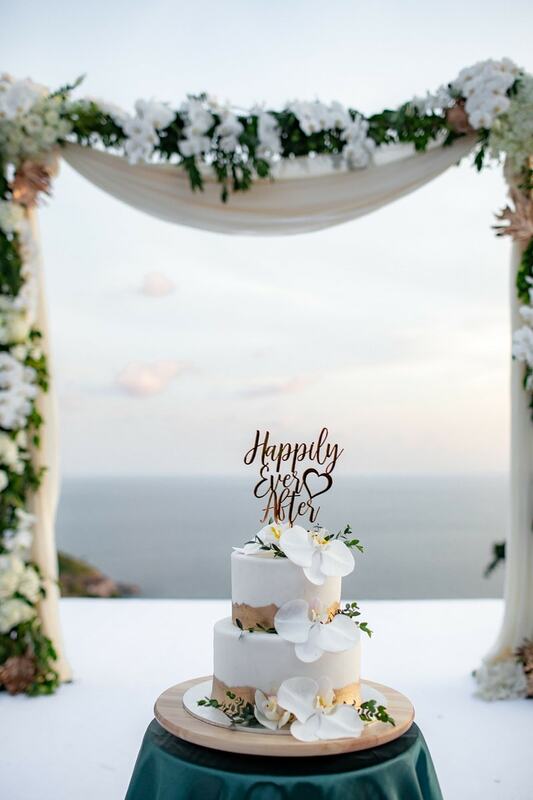 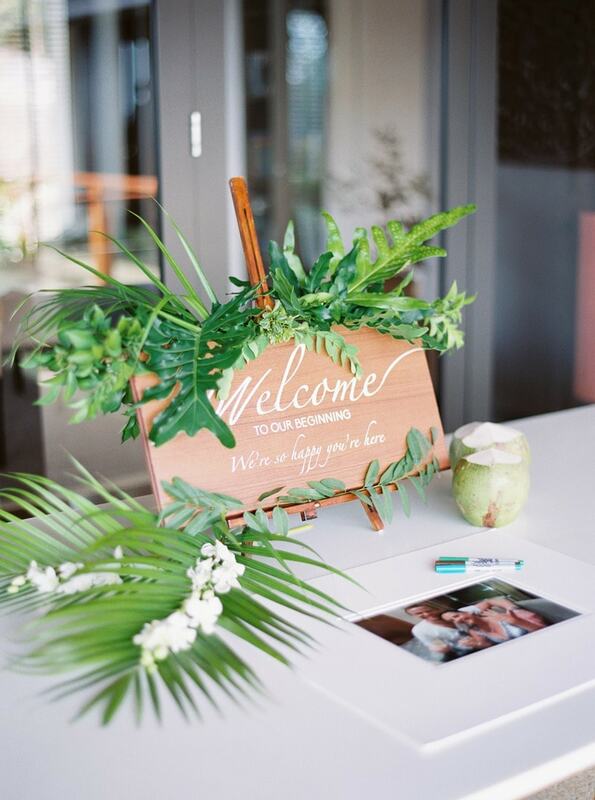 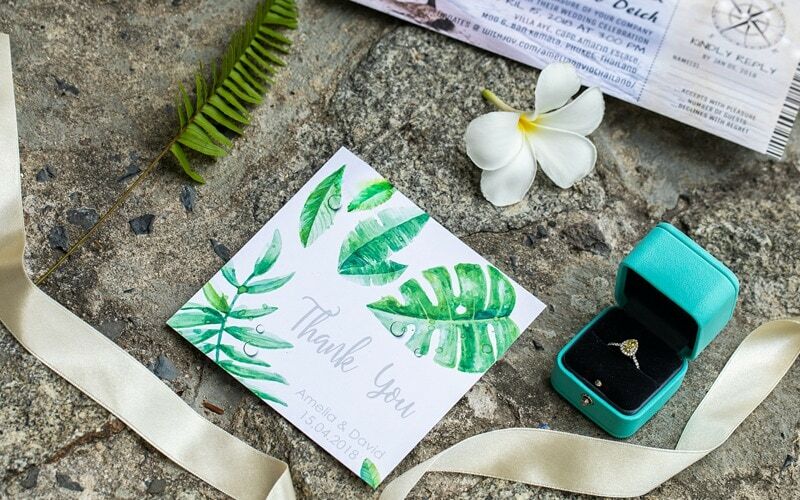 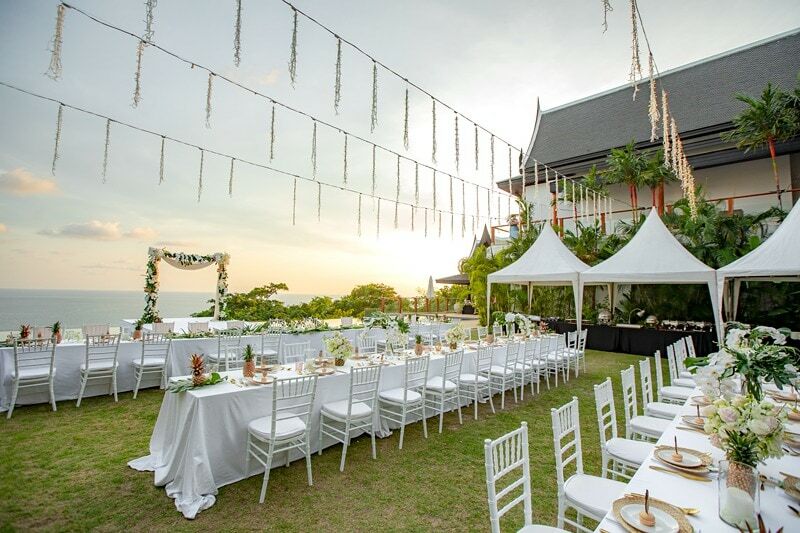 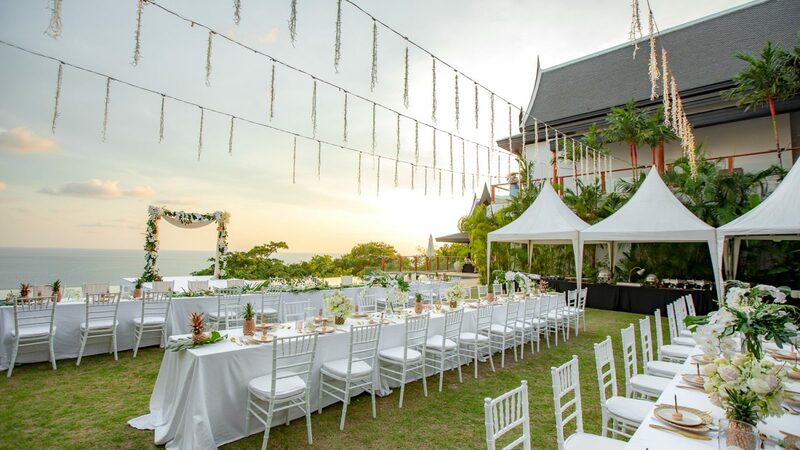 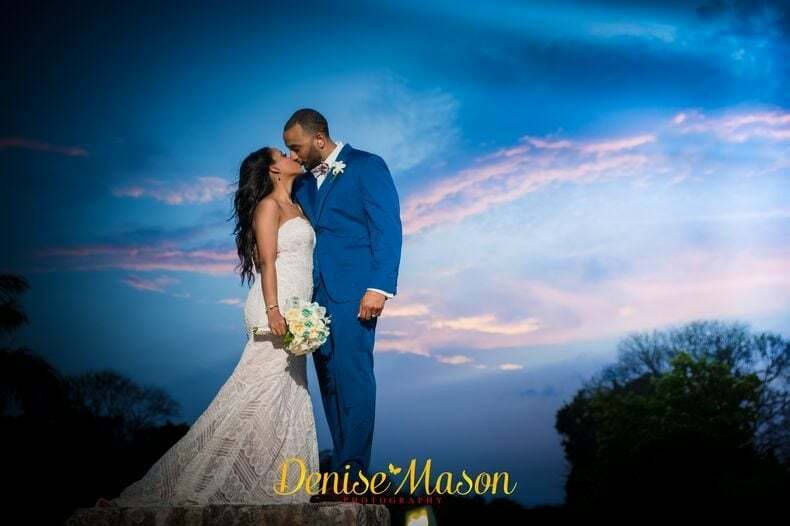 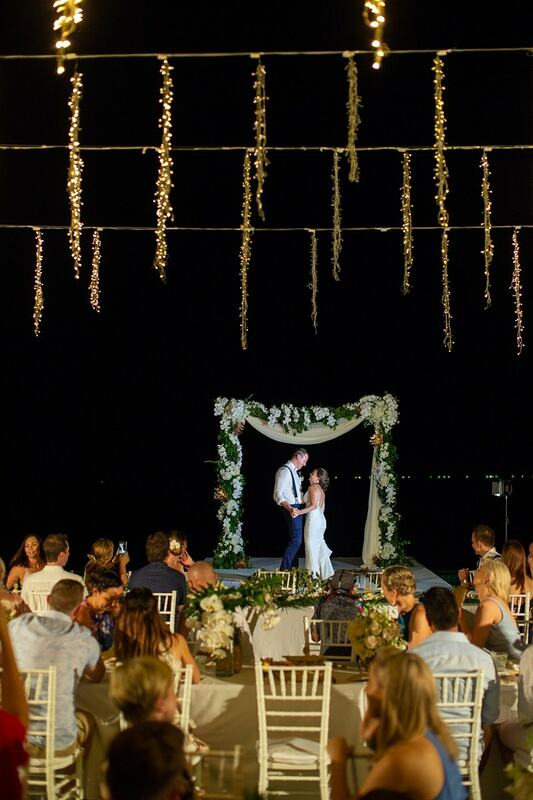 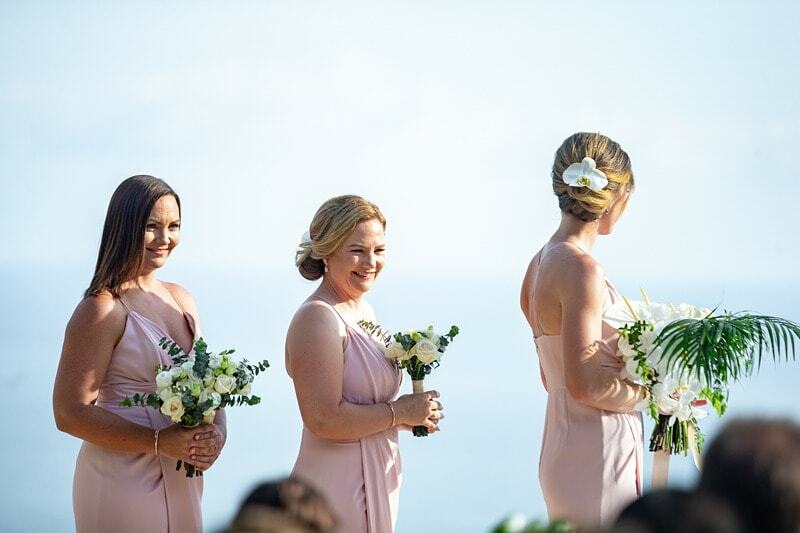 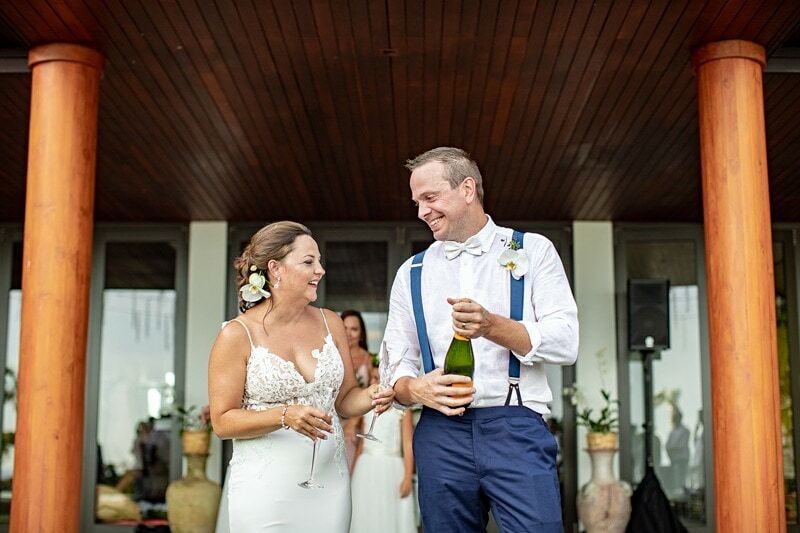 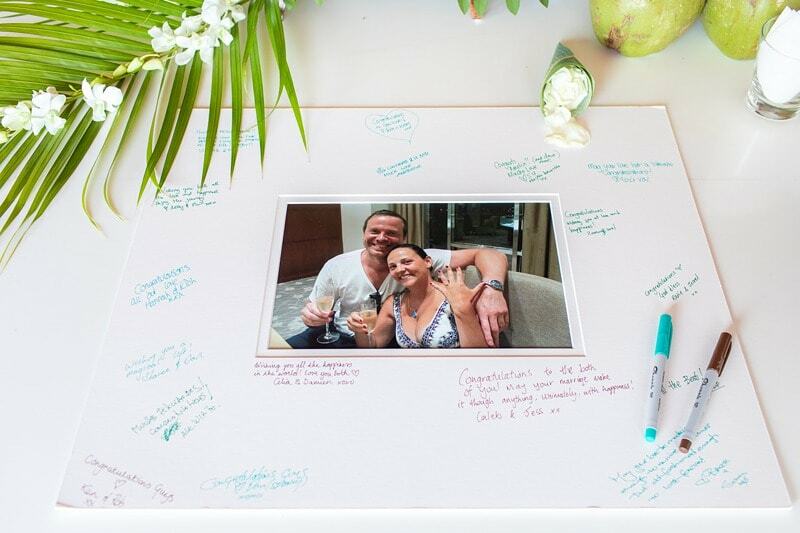 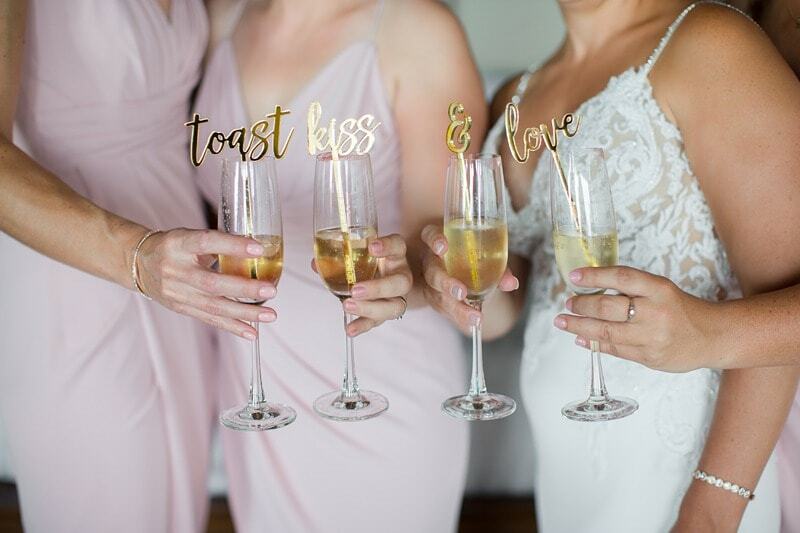 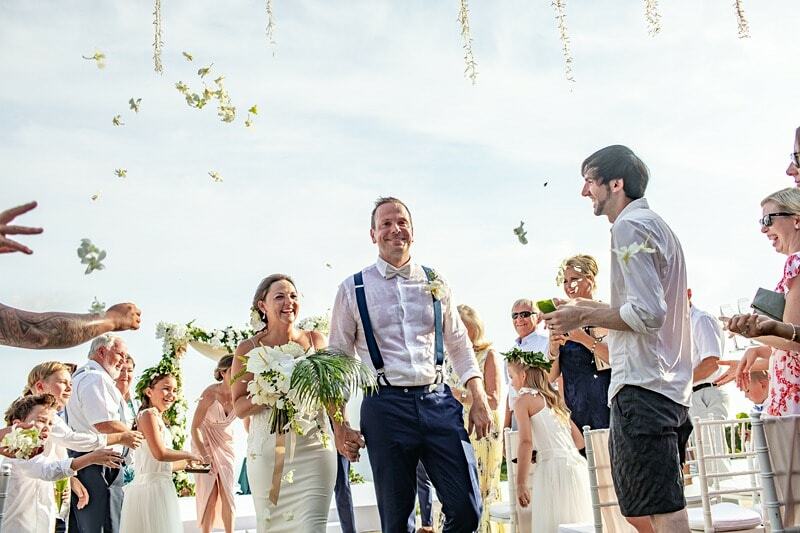 So take this couple’s advice… When you plan a destination wedding half a world away like Amelia and David, you must choose a planner you can trust – and boy did the team at Wedding Boutique Phuket come through. 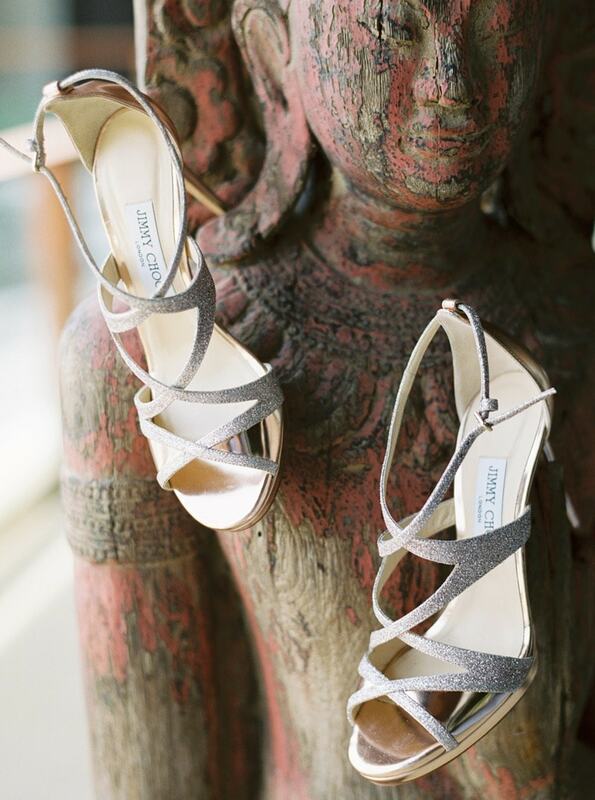 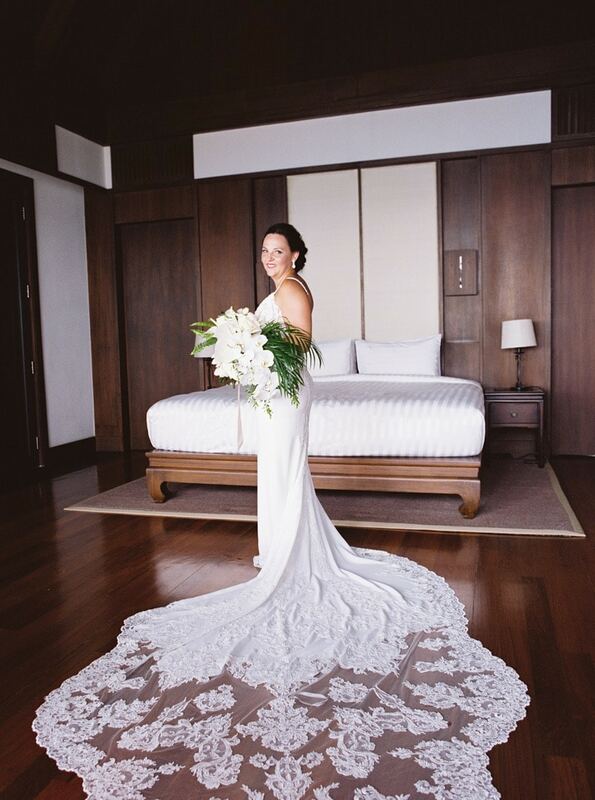 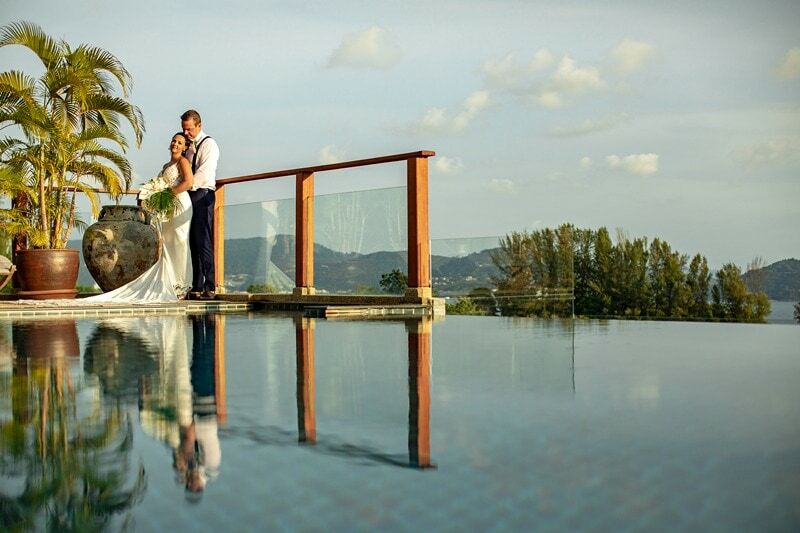 The talented Ken Tan was there to capture every detail you’ll see in these stunning photos! 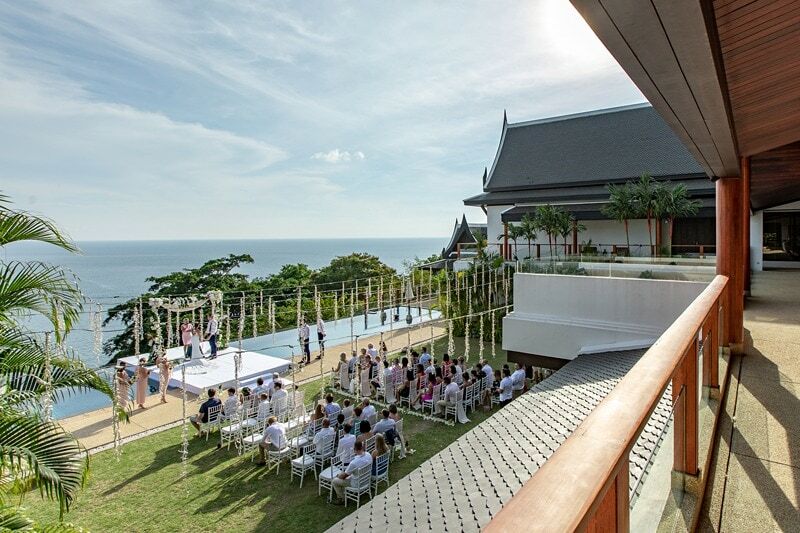 Why did you choose to have a destination wedding in Phuket? 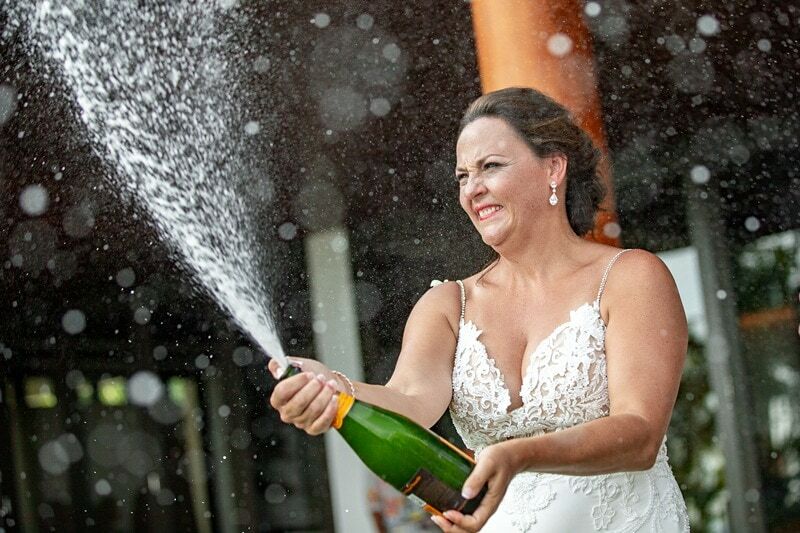 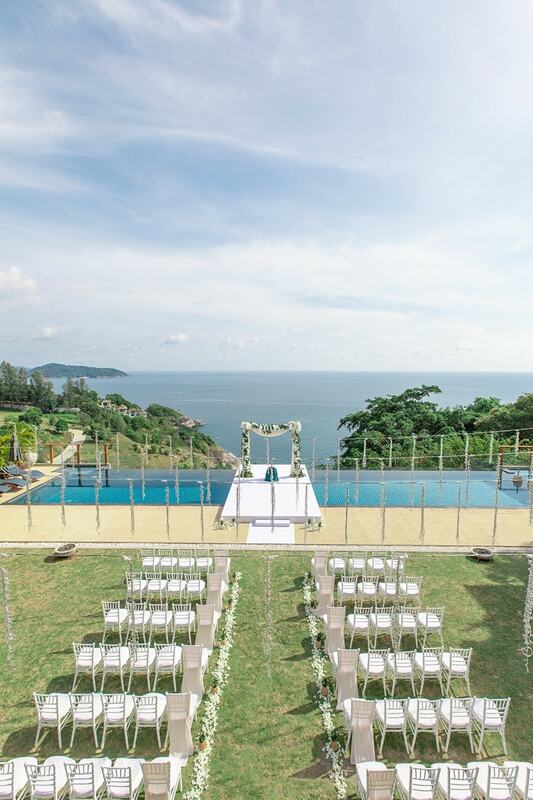 How many people attended your destination wedding in Phuket? 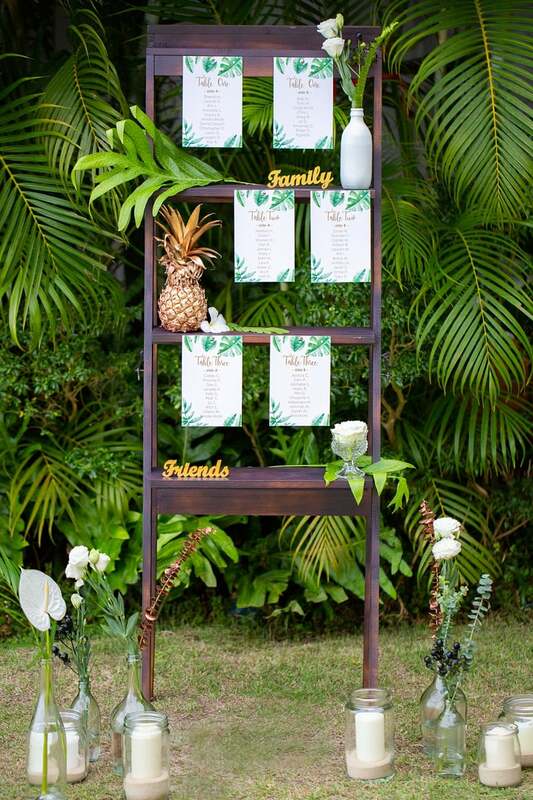 My planner was key in taking a mismatch of ideas that I had seen online, and turning them into a wedding theme and plan. 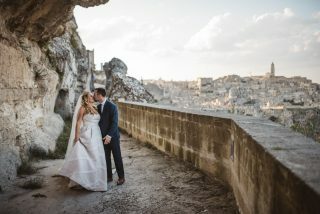 She was great at taking what I knew I wanted, what I didn’t want and what I didn’t even think about, and adding it to my design. 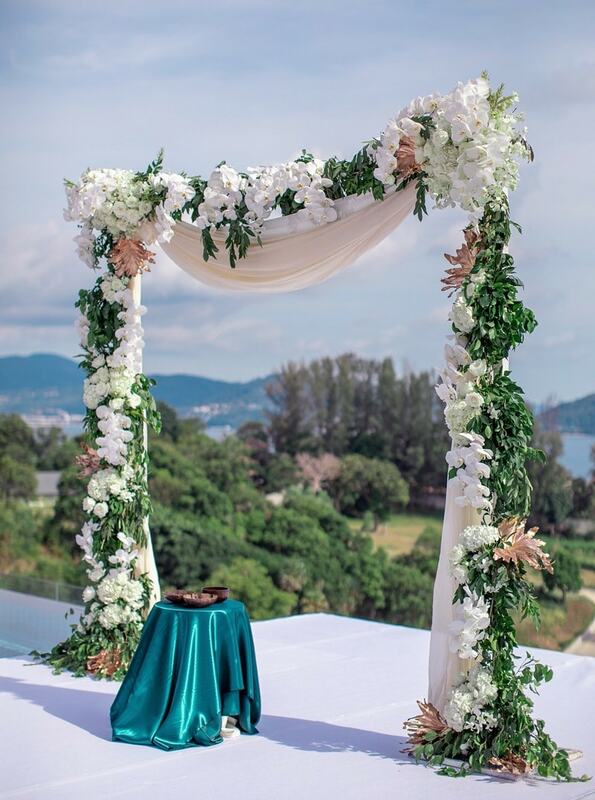 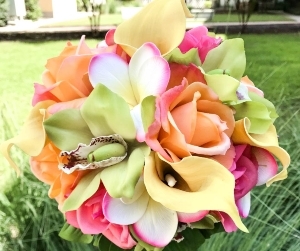 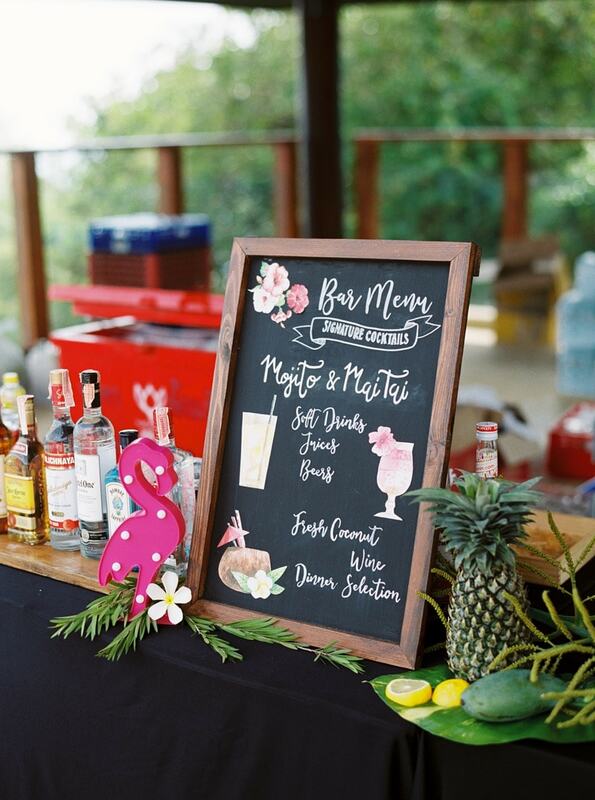 Being in Thailand I wanted the wedding to be fun and colorful and playful. 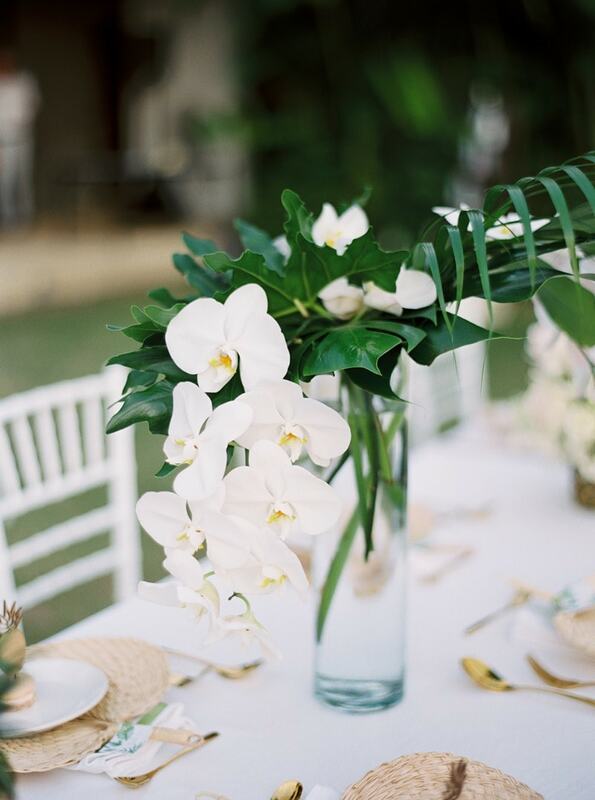 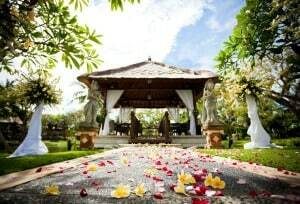 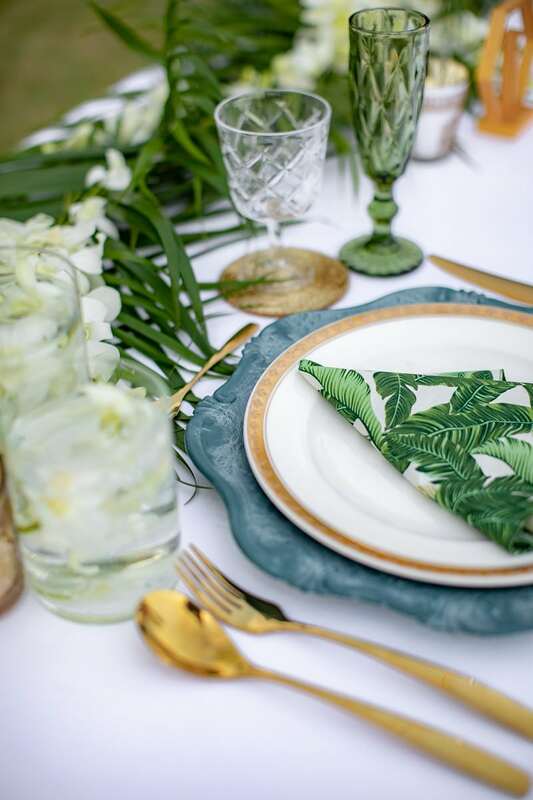 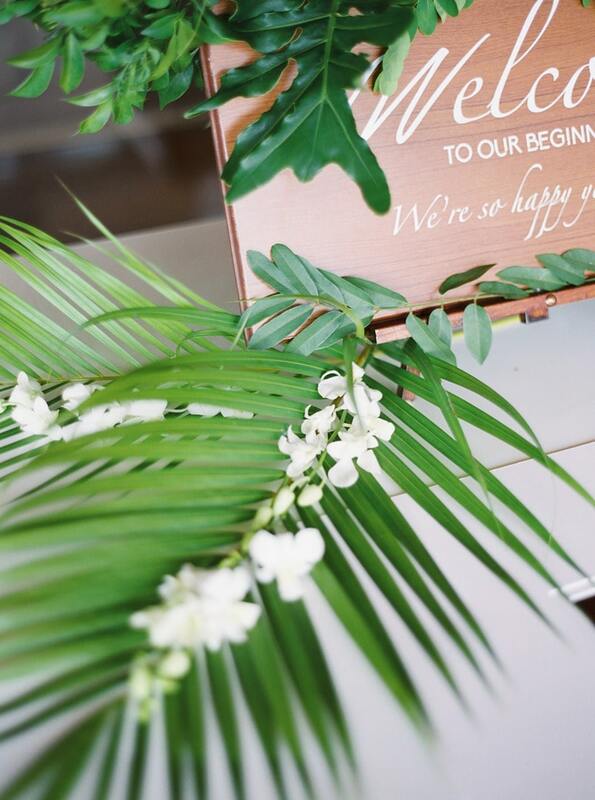 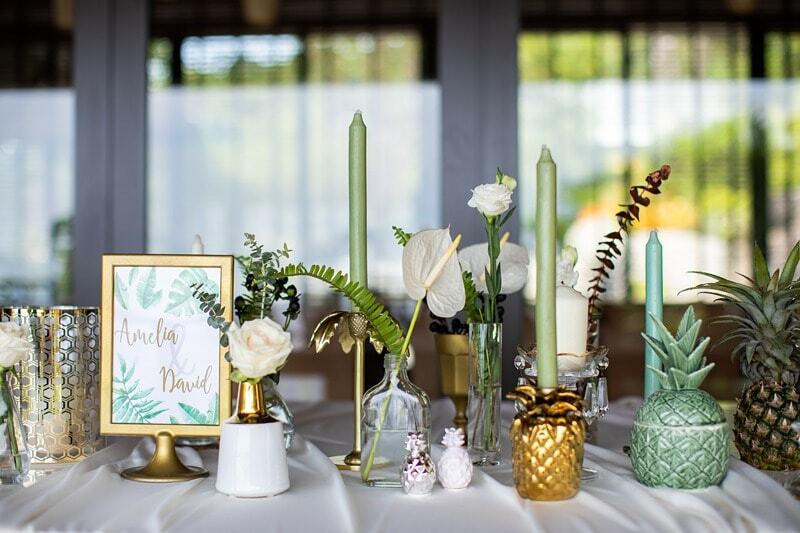 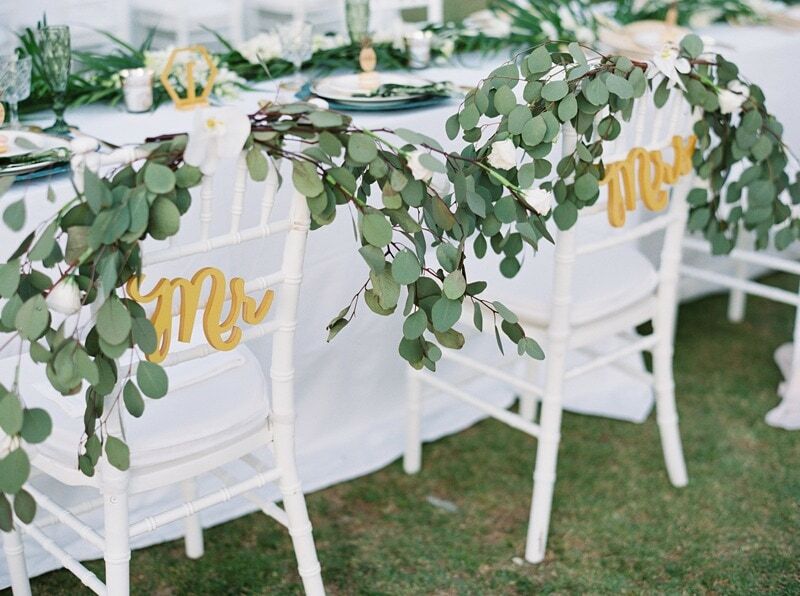 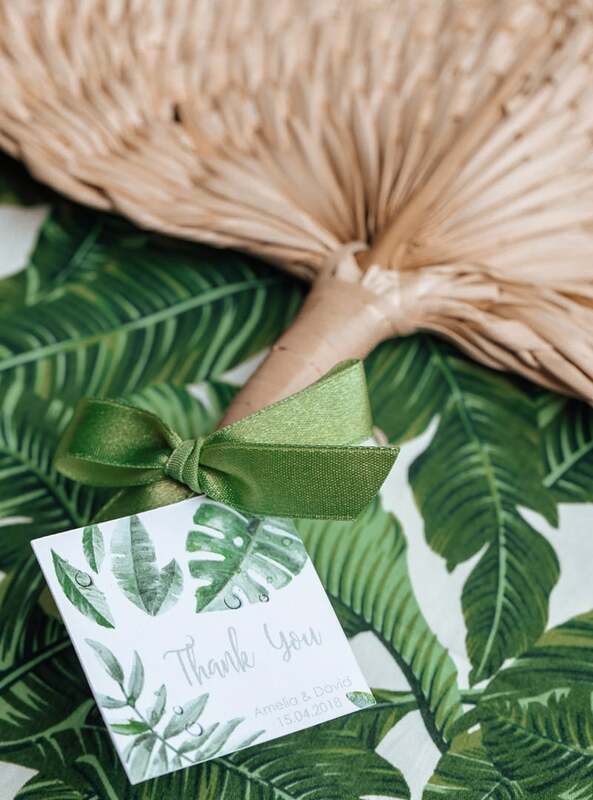 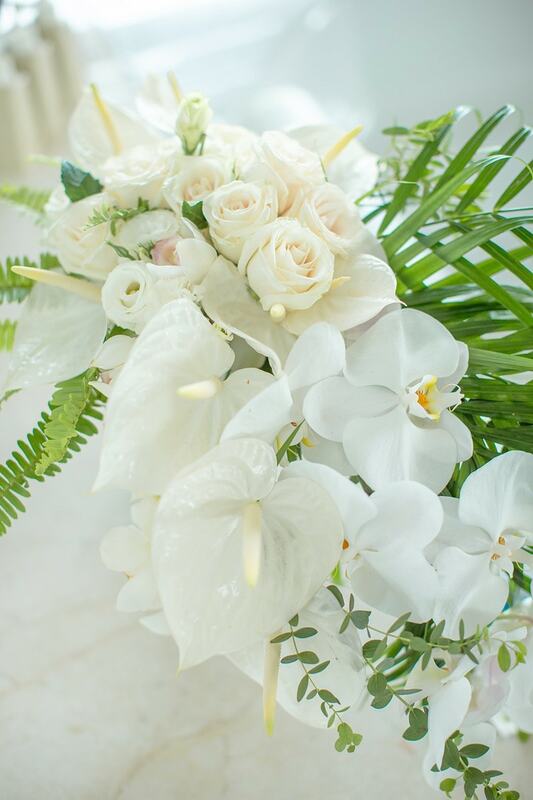 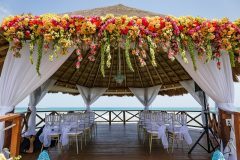 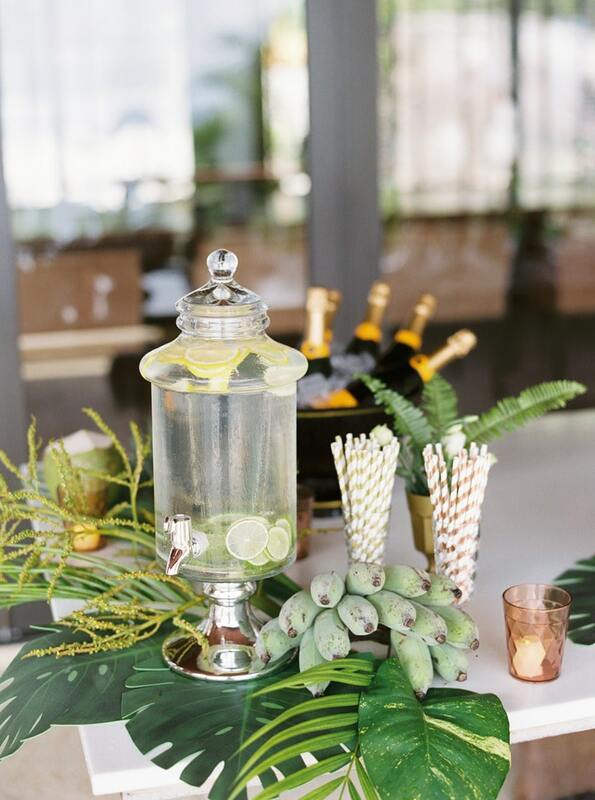 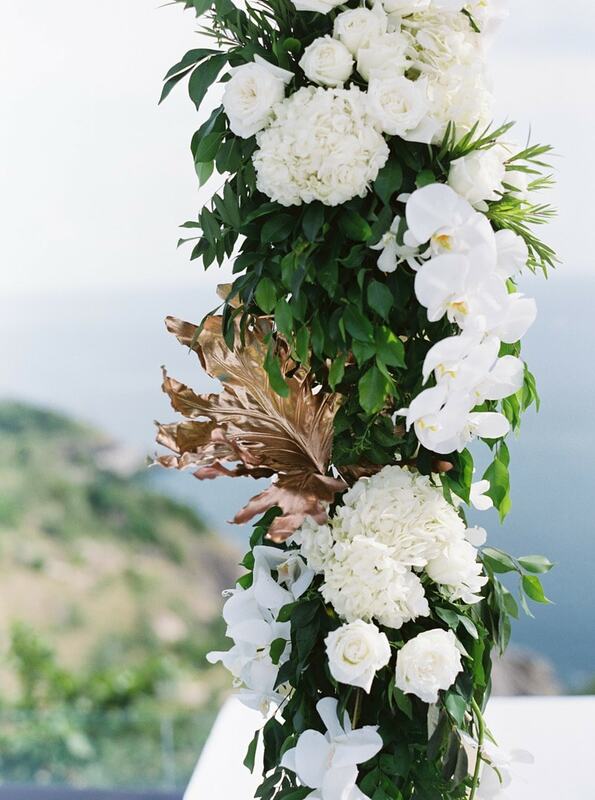 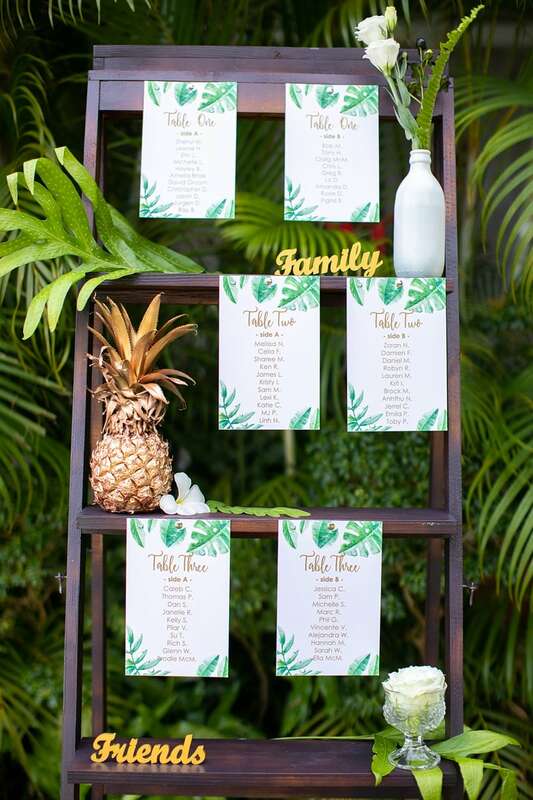 When I saw the beautiful villa and I spoke with my wedding planner I knew we needed to bring in the fun and tropical elements with the elegance and luxury of the villa. 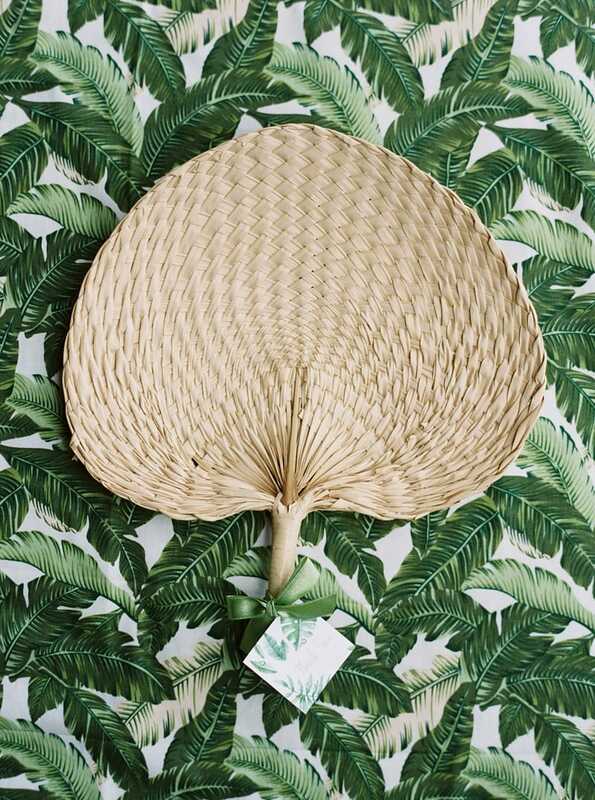 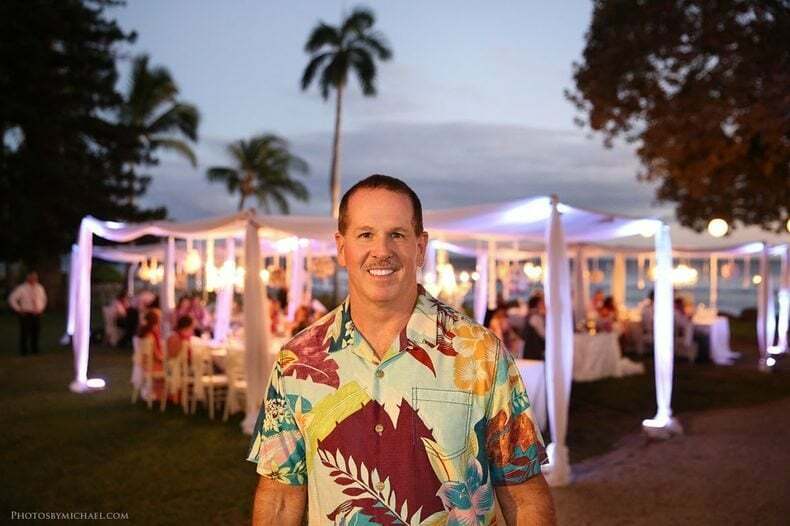 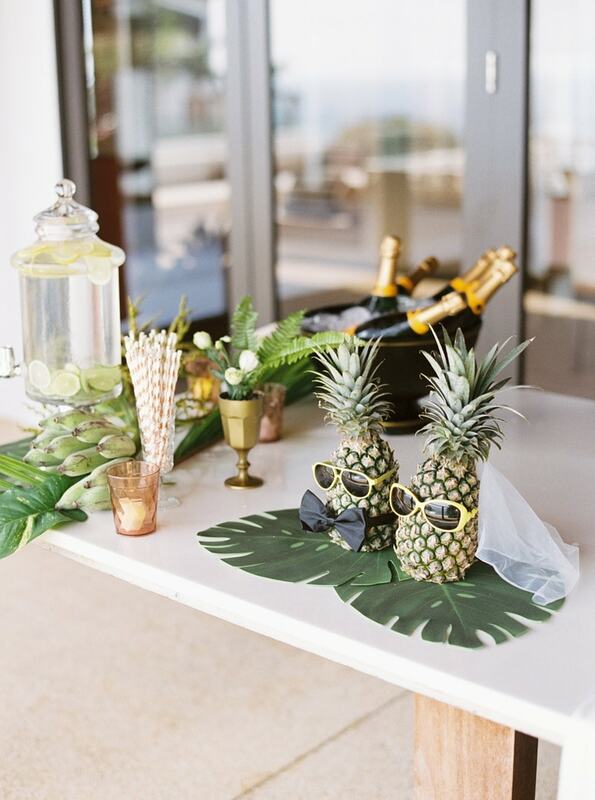 I had a great mix of tropical, fun and elegance. 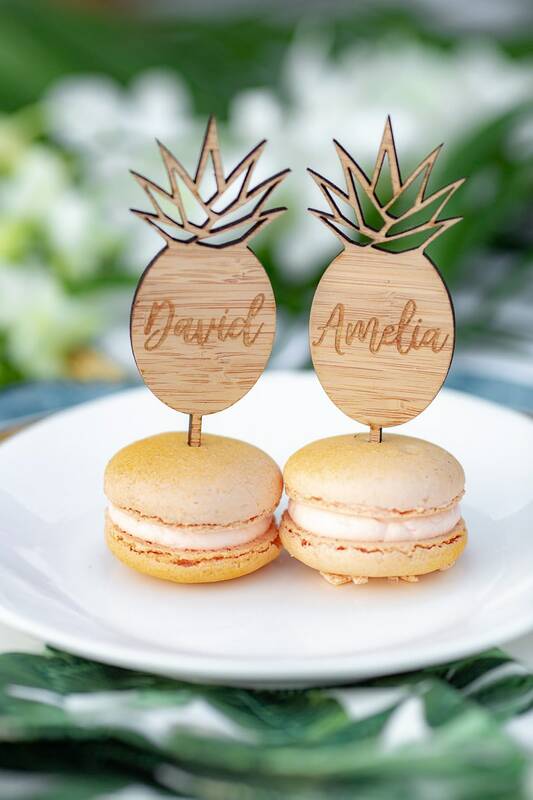 I loved my carved individual named pineapple place card on macaroons. 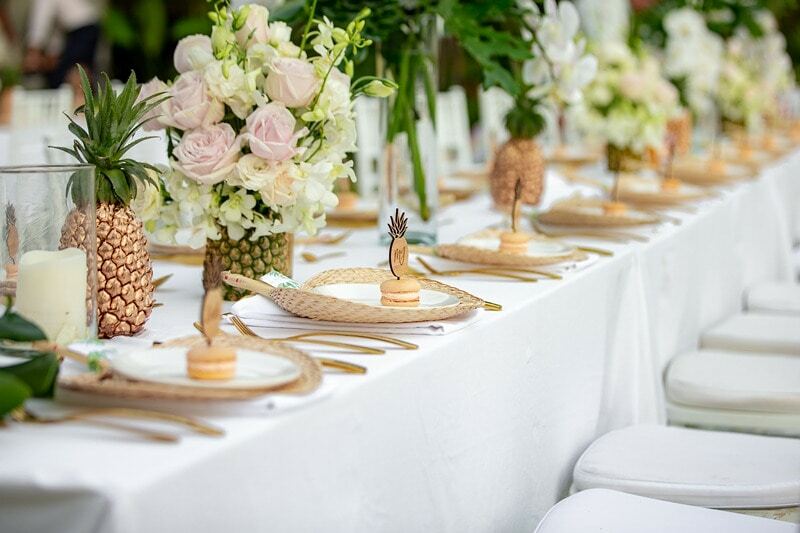 They looked so cute and tasted AMAZING! 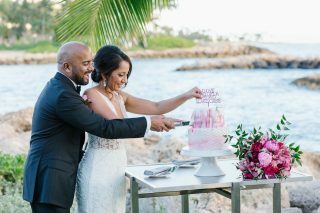 We did our wedding dance before dinner and cut and served the cake. 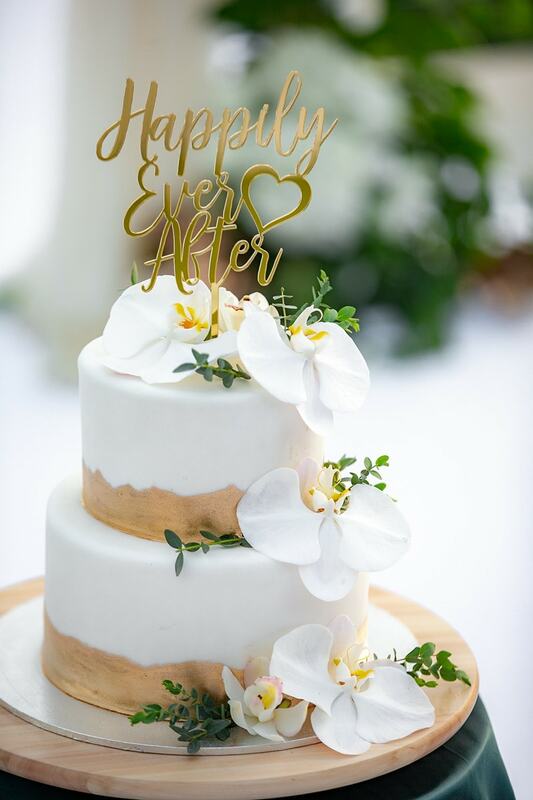 We wanted to make sure our guests enjoyed the cake and we enjoyed the dance before we were full! 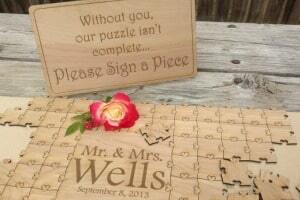 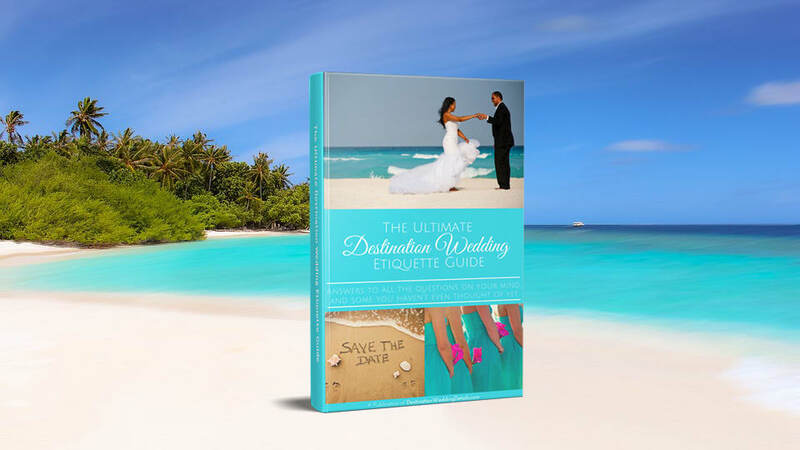 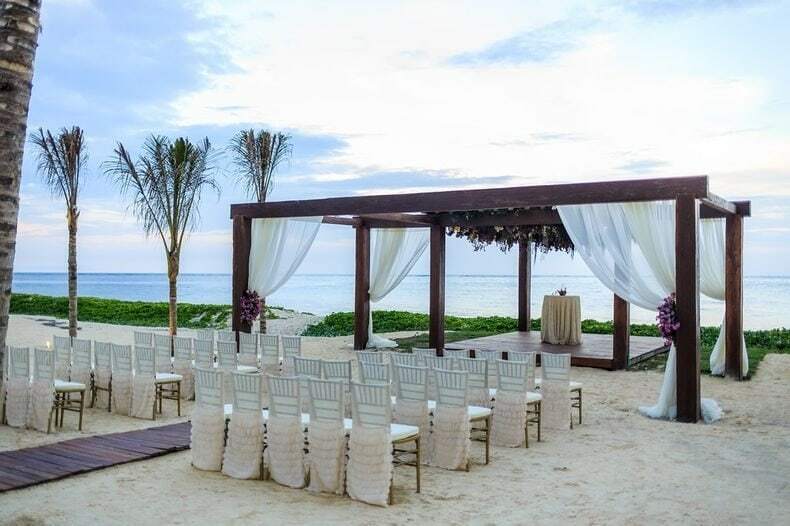 The intimacy and friendship that you feel having a destination wedding is fantastic. 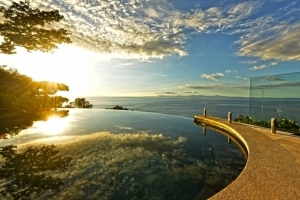 You know the people are there because they really want to be and everyone is in holiday mode! 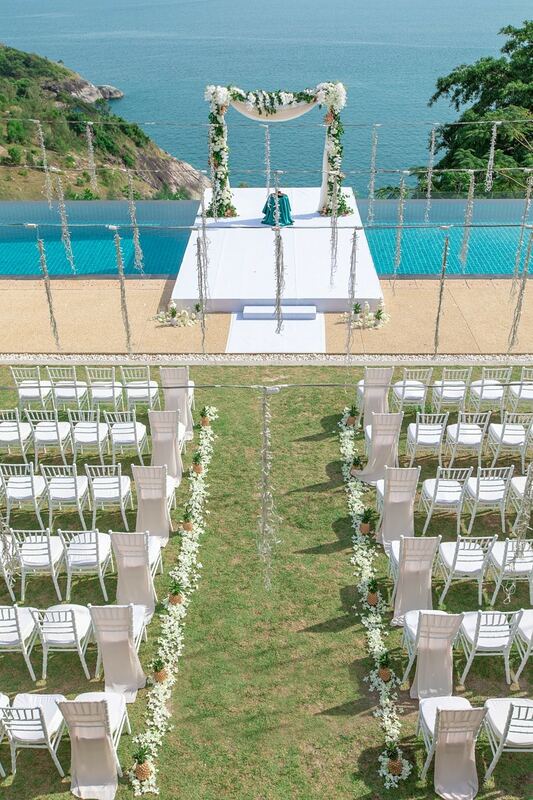 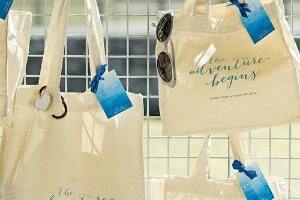 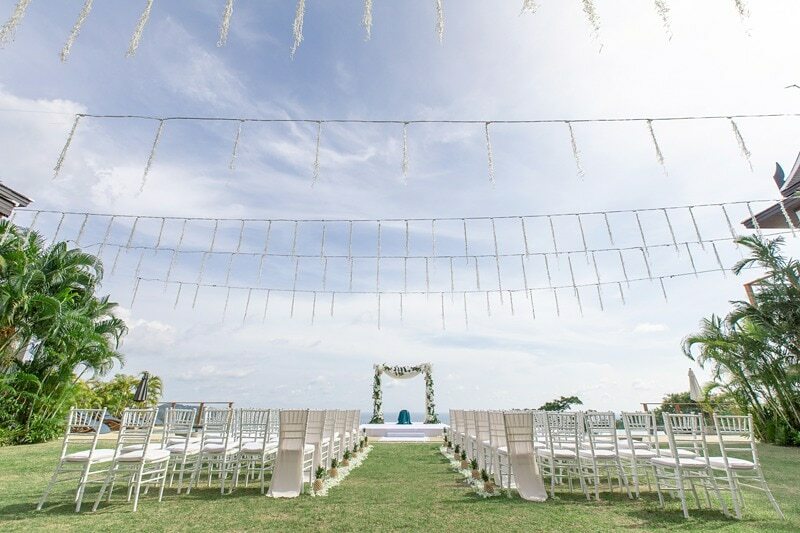 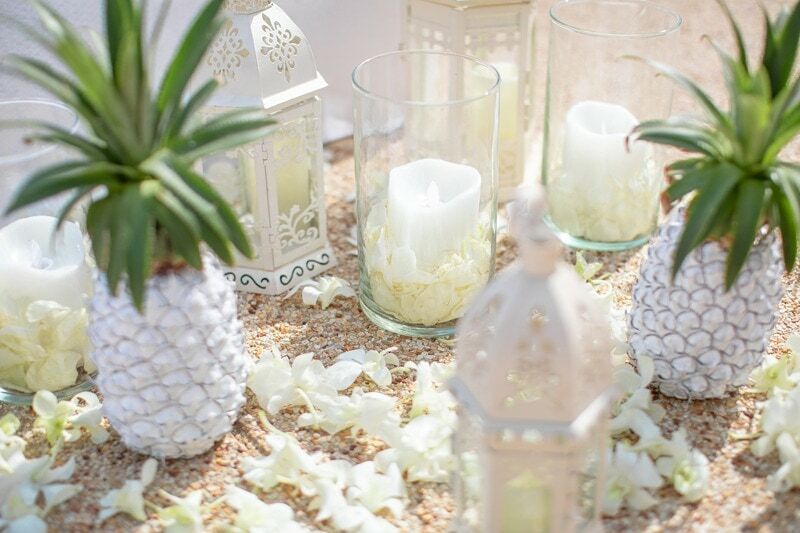 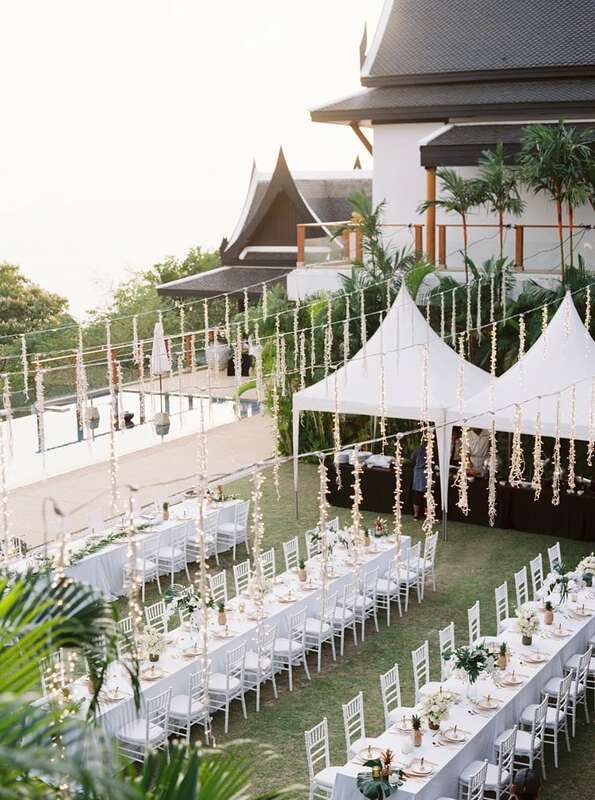 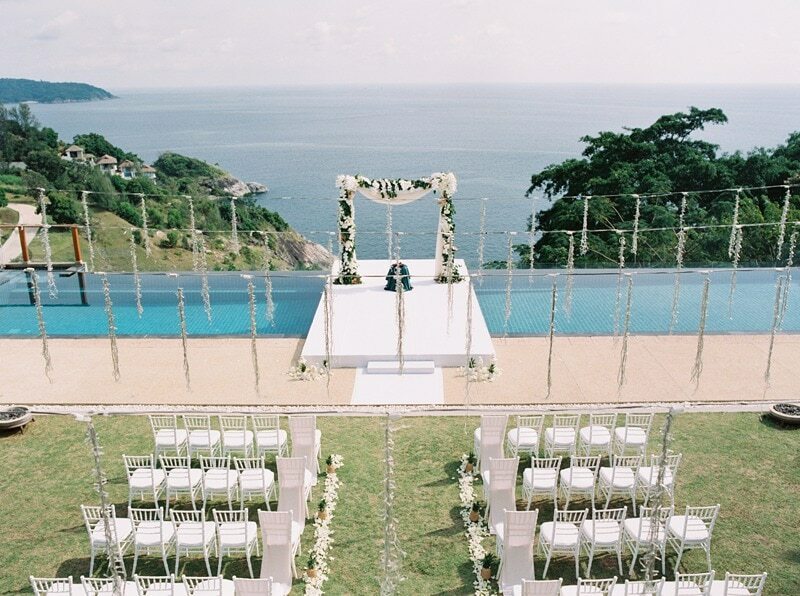 What was the biggest challenge in planning your destination wedding in Phuket? 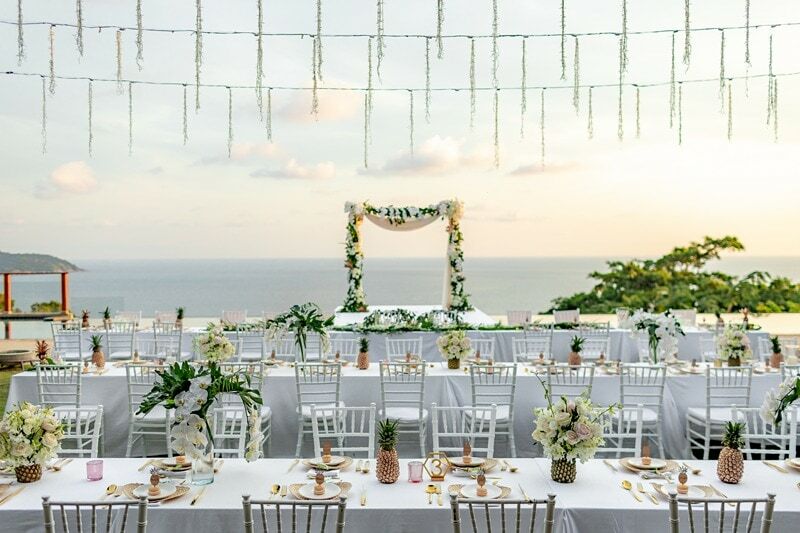 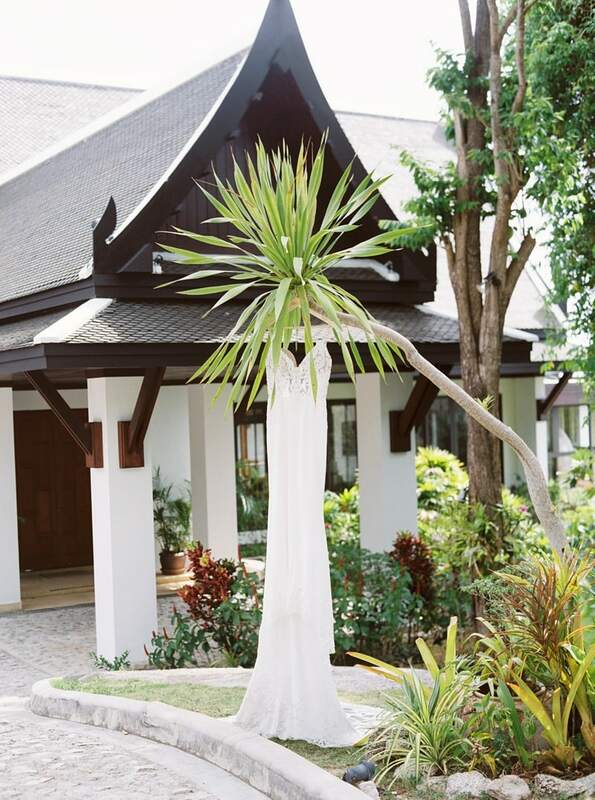 What’s your advice to other couples planning a destination wedding in Phuket? 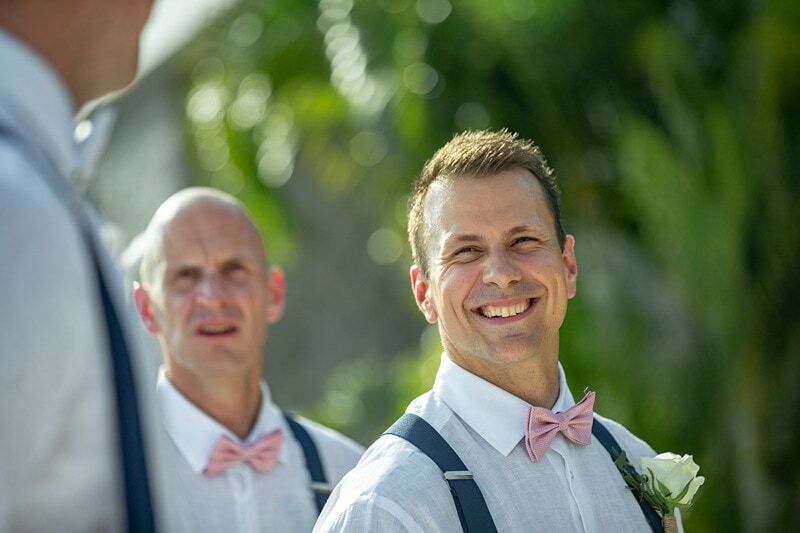 Ken was a great photographer that made me feel relaxed and able to have the great photos I ended up with! 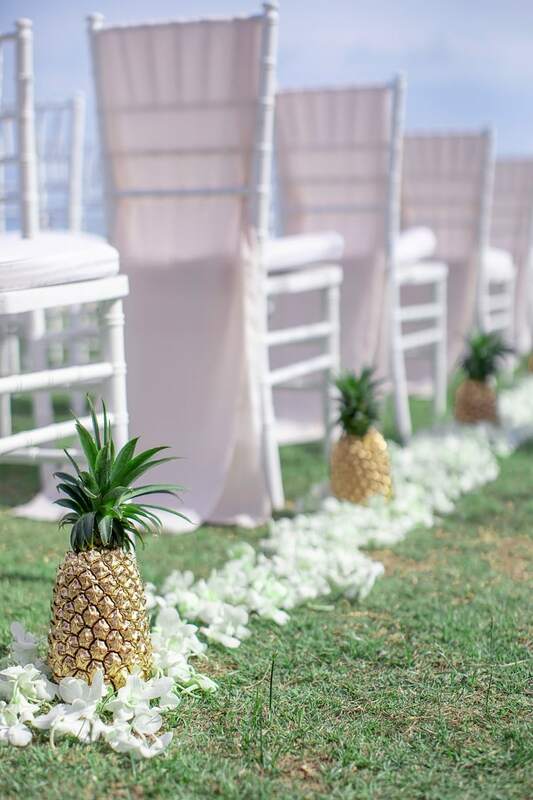 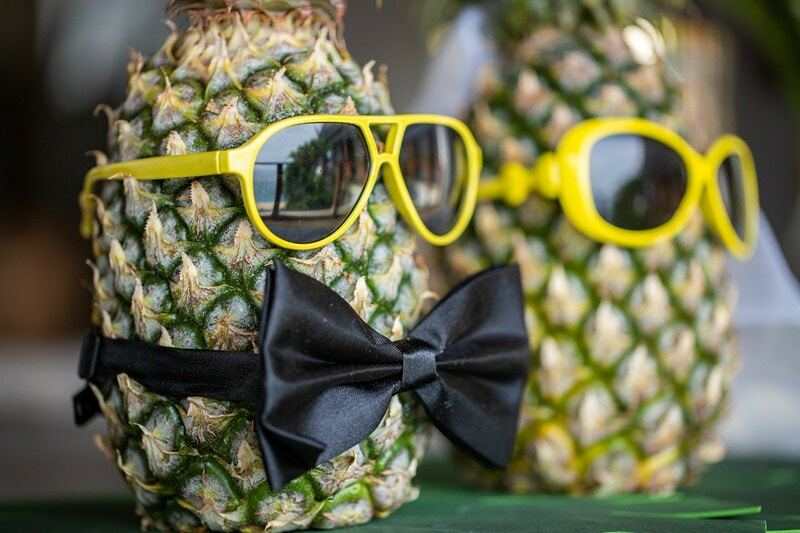 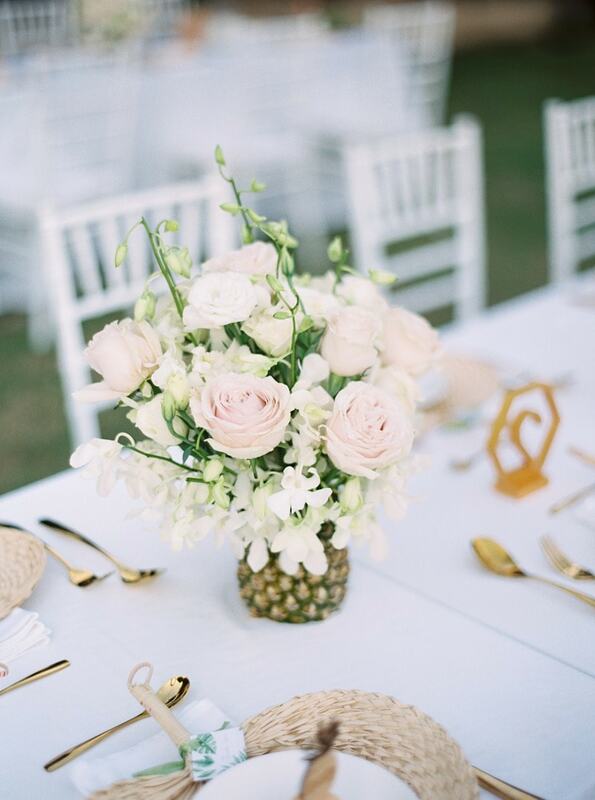 Loving all the pineapple details!